Renovating or finishing your basement is a great way to add extra space and to add value to your house. In-floor heating transforms your basement into a cozy room, in which to entertain or work. Why Install Floor Heating in a Basement? Basements are often the last room in the home to be renovated and are frequently left to be simply unheated storage spaces or utility rooms. By installing radiant floor heating in a basement, you can maximize the potential of this overlooked space by turning it into a large and cozy family room or workspace. A floor heated basement can double your living space. Imagine coming home from a long day at work and going downstairs to your own home cinema or creating a fully-functional, comfortable home office. With underfloor heating, your fantasy basement conversion can become a reality. Floor heaters bring the comfort of warm floors to a cold basement and are an energy-efficient heating solution. They use a lower temperature than traditional heating systems whilst providing an optimal heat output, thereby reducing energy usage and in turn, the costs of heating your home. Radiant floor heating also offers great design freedom as you can create the ultimate basement of your dreams without being restricted by obstructive radiators and piping. Due to their ‘unfinished’ nature and because they often have small or few windows for ventilation, basements can feel quite dusty and damp. Radiant floor heating offers a great solution to this as the heaters improve the air quality of the room by reducing dust circulation. Using floor heating with a Warmup Smart Thermostat greatly enhances the efficiency of the system in your basement by providing automatic heat, gently warming up the room to your preferred temperature in time for your arrival home. Our selection of electric underfloor heating systems offer great flexibility for your basement renovation. Whether you are installing a heater in a new-build construction project or retrofitting a system into your existing basement, all our heaters are easy to use and quick to install by a qualified installer. Which Heating System per Floor Covering Types? In North America, the most common floor finishes in a basement are usually vinyl or carpet. For carpet, laminate, or floating wood floors, Warmup offers a dry installation heating system, made of aluminum FOIL sheets, where a heating cable is embedded and pre-spaced. 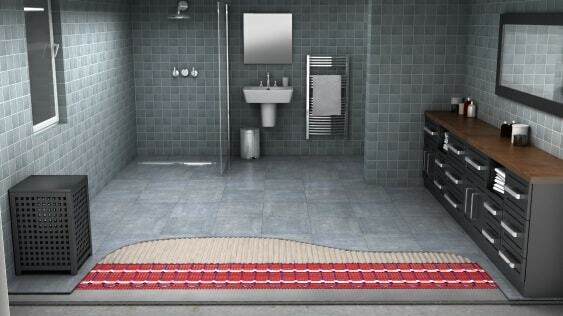 The Heated Floor Mat System features an ultra-thin heating wire and a self-adhesive backing for rapid installation times and a low-profile floor build-up. This system is ideal to use in basements with floating floor finishes, such as vinyl. If you’re installing a tiled floor finish in your basement, the DCM-PRO Uncoupling System is the ideal floor heater to use. It has been specifically designed for tiled flooring and features an anti-fracture matting which can help prevent damage to the tiles. The Inslab Cable System is perfect for new basement construction projects with a concrete floor. The heating cables are installed directly into the concrete for a consistent, even heat distribution. Unfinished basements frequently feature concrete floors but as part of a renovation project, typical chosen floor coverings include tiles, laminate or carpeting for extra warmth. 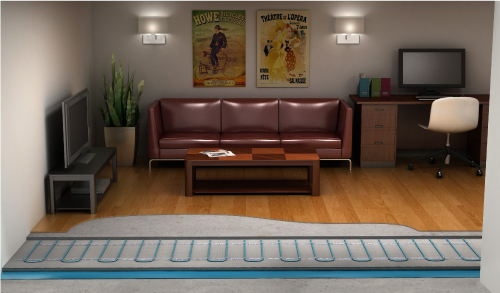 Warmup have a wide range of electric floor heating solutions suitable for all floor finishes. Using Insulation Boards with a heated basement floor significantly reduces the heat-up times and running costs. At Warmup’s Research and Development Center, we are constantly testing to see the best way to run underfloor heating and to provide the easiest and most convenient way to reduce the heating costs involved with running the system. Our extensive research conducted on the impact of proper insulation on energy usage has shown that quality insulation is key to improving your ramp-up times and hence reducing heating costs. With electric underfloor heating, the best place to install insulation is right beneath the heating system. The insulating material will stop the heat from spreading downwards, reflecting it back up to the floor finish instead. This is particularly pertinent when the subfloor is concrete as a non-insulated base can dramatically delay the heating effects from being felt through the final floor finish. The Warmup Insulation Board not only directs the heat to where it needs to be but doubles up as a sturdy tile backer board for increased heater stability. Made of extruded polystyrene, the board is faced on both sides with fiberglass mesh embedded into a thin cement polymer mortar. The board is tough and water-resistant and can bear impressive weight loads of 30 tonnes per square meter. It is available in varying thicknesses and is suitable for most applications, especially for radiant floor heating in a basement. Depending on the cost of electricity and price of the insulation boards, pay-back time was estimated between 1.7 and 2.1 years. All of Warmup’s heating systems are competitively priced and the increased energy-efficiency of heating your basement with a floor heater results in much lower running costs. See our Running Costs Calculator to see how much you can expect to save.